Residents and electrical crews spent Thursday cleaning up and restoring power in Cleburne as homeowners feel lucky to be alive. Homes along the roadway are missing entire sections the day after an estimated EF-3 tornado hit three neighborhoods in the Johnson County city. At a news conference on Thursday, Mayor Scott Cain says the tornado reached speeds of 140 mph and National Weather Service says it had a path 8.5 miles in length. While damage at Country Club and Hyde Park Drive is significant to some homes, many others only suffered roof or tree damage. 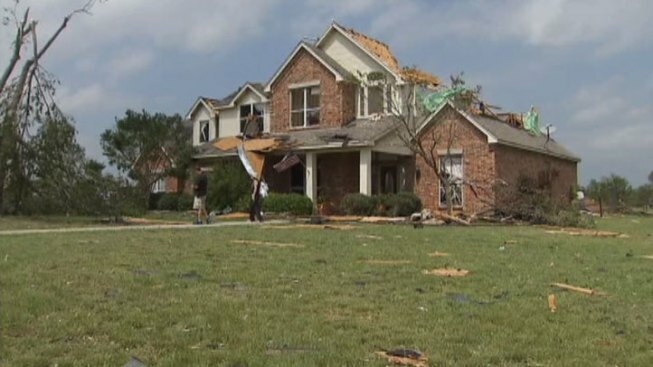 In one subdivision, near Lake Pat Cleburne, every home is missing some part of its roof. "We ran inside and got into the kitchen right behind the counters and about that time it hit," said Cleburne resident Jeff Dugger. Dugger's roof and parts of his second floor are gone, but his wife, kids and dog are all fine. They survived the experience in the kitchen. "Too early to tell if we're going to need builders or bulldozers," Dugger said. Dugger says they knew the storm was coming. He says it hit for about seven seconds before lifting. Dugger says his family almost started to get up when it hit a second time for what he said felt "like an eternity." In reality, it was about 15 seconds of swirling glass and falling insulation. "The house couldn't take much more, we knew when we got covered in insulation that our roof was gone," Dugger said. Dugger's home is one of more than 600 damaged homes, according to Mayor Scott Cain. Cain described 30 of the homes as dramatically damaged. No deaths or serious injuries have been reported in Cleburne – only nine people were treated for minor injuries. Cain says it's the worst natural disaster to hit his town during his lifetime. "The amount of damage in the Winchester Edition when I first got there was a bit overwhelming to take it all in," Cain said at a news conference. Cain and other local leaders credit the National Weather Service and media outlets for spreading word of the storms and preventing any major injuries or loss of life. "It's hard to look around the neighborhood and think we're lucky," Dugger said. "But everybody, every house here, is shaking their heads here with a smile saying, 'we're lucky.' We're lucky folks." A curfew is in place for the impacted areas from dusk until dawn. Numerous police agencies are only allowing residents into the damaged areas. Cain issued a strong warning for anyone trying to loot items. Cleburne leaders and residents have also expressed concerned about the devastation to the west in Granbury and Hood County.